Redwood Barn -- Where is Davis? 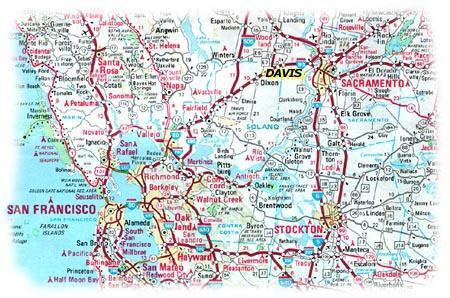 Davis is located in the heart of Northern California on Interstate Highway 80, 13 miles west of Sacramento, and 56 miles northeast of San Francisco. Reachable within a few hours drive from this area are unparalleled scenic beauty and recreational opportunities. To the east are Lake Tahoe and the Sierra Nevada Mountains (great attractions year round); to the west are the San Francisco Bay area, the great coastal redwood forest, and the beaches and rugged shores of the Pacific Ocean; to the south lies the delta region for fishing and boating.